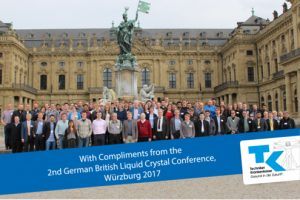 A report keeping you up to date from the recent 2nd German-British Liquid Crystal Conference 2017 in Würzburg (Germany), can be found on their homepage here. You may view some conference photographs from the here. The BLCS Annual Meeting 2017, will take place 3rd-5th April at the Toscana Hall in Würzburg Residence, Germany. 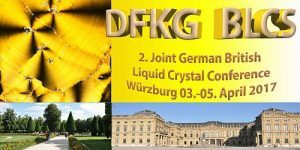 This will be the second time the British and German Liquid Crystal Societies have joined forces to bring together an exciting joint meeting. The conference will cover cutting edge research across all elements of liquid crystal science, including chemistry, physics, mathematics, engineering, materials science and bio-science. Deadline for abstract submission: Wednesday 8th February. Deadline for registration: Friday 24th February. Please see the opportunities page to apply for student travel awards to this conference. The first British Liquid Crystal Society Young Researcher meeting, to be held at Durham University on the 13th of January 2017, is now open for booking here. While the focus of the meeting is on hearing about the work of research associates and PhD students, we welcome those at all stages in their career to attend what is promising to be an excellent day of science. We are excited to have Prof. Helen Gleeson of Leeds university to deliver our plenary lecture, as anyone who has seen Helen speak before knows she is not to be missed! This meeting provides an excellent opportunity for young scientists to practice presenting their research in a friendly and informal environment, and we hope to see many faces (new and old) there. 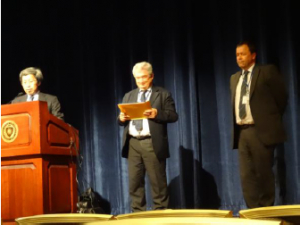 Ingo Dierking, (Physics and Astronomy, University of Manchester), and Georg Mehl, (Organic Materials Chemistry, University of Hull), were honoured with the Mid-Career Awards, presented by the International Liquid Crystal Society at the ILCC2016 in Kent, Ohio. Read more here. Ingo received the Samsung Award “for his pioneering research and continued leadership in the area of polymer stabilized liquid crystals and liquid crystal-nanotube hybrid systems. Also highly recognized are his dedicated contributions to the liquid crystal community in a wide range of executive capacity”. Georg received the LG Award “for his pioneering research and continued leadership at the frontier of chemistry and materials sciences of novel thermotropic liquid crystals, which not only elucidated the fundamental governing principles of mesophases and made a ground breaking progress into new forms of liquid crystals”.